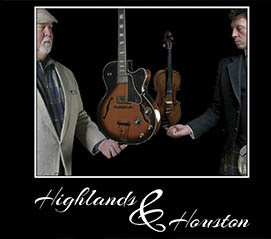 Michael Hurdle and Paul Anderson have teamed up to create a wonderful album titled, Highlands & Houston. Not bound by genre, but created in the spirit of the pursuit of good music, guitarist Hurdle’s collaboration with the Scottish fiddler Paul Anderson is a melding of Scottish sounds, Celtic colorizations, latin rhythms, fifties rock-n-roll, mixed with a little Texas spice. Highlands & Houston is a true fusion across musical genres. Hurdle’s clean Strat sounds bounce into the airwaves with a little Texas blues/country gusto for the opener “Cabin Fever.” The tune is a Hurdle original, an enjoyable musical package that is full of musical sections and transitions. Anderson’s upper register melody floats over the groove and brings a fresh sound. Scottish influence can be heard in the building to the musical climax as Anderson embellishes the melody. The violin adds a well-produced and beautifully melodic color on this opening track and foretells the music to come. “Window in the Clouds” is a lovely ballad written by Hurdle. Set to a six-eight feel that recalls early rock n’ roll (1950’s) stylings. After a nice chordal intro by Hurdle, the gorgeous melody is stated by Anderson. Hurdle’s chordal movement is very enjoyable and adds interest. The band makes a transition to a double time feel for Anderson’s solo. His solo is strong and appropriately embellishes the melody and feel. “The Rose of Glen Davan” is an Anderson original that features a melody that offers a stellar counterpoint melody. This tune delivers a catchy memorable melody, which you will find yourself continuing to sing, long after the tune is over. Anderson’s violin sound is warm, round and focused with impeccable intonation and excellent vibrato control, it is always a treat to hear such an accomplished musician. “River Road” is such a stunning and joyful song featuring a relaxed melody penned by Hurdle. Hurdle’s playing on this one is really a stand-out, strong solo fills and intricate chordal work. The group transitions are excellent and easily flow from section to section. Again, Anderson’s melodic playing is always adding beauty in the way he colorizes a song. His lines float over the band and his melodic embellishments are always musical and in context. 1 Comment on "Michael Hurdle & Paul Anderson | Highlands & Houston"
Thank you for the kind words sir. I’m glad you found something to like and hope others will as well!